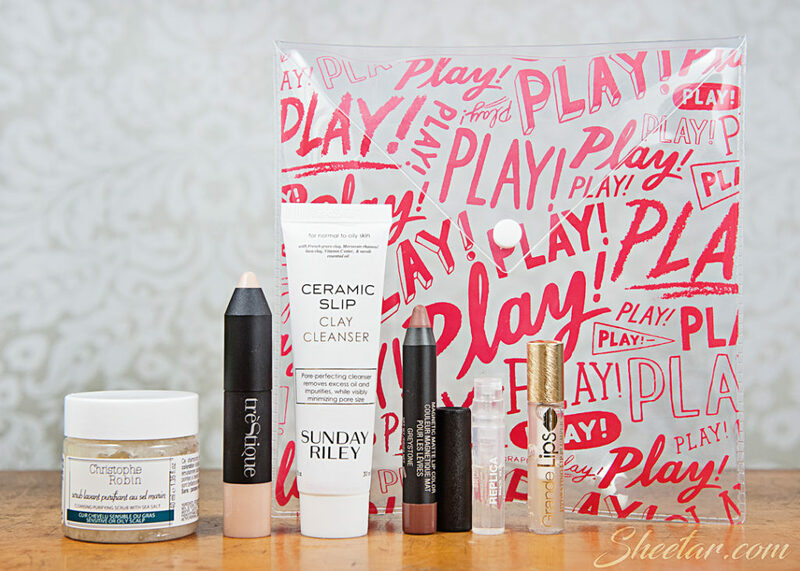 May’s Sephora Play! has arrived! For those of you that are avid Sephora Play! fans, my box variant was #264, and my profile is set to dry skin and dry hair. Unfortunately, it seems like the profile went out the window this month since I got products that are all for “Normal to Oily” skin or oily scalp. Complete miss on the product selection there, Sephora. The theme this month was, “The Rising Stars,” and I think this might be the first theme that they actually paid attention to the theme. All those brands are relatively new and are gaining popularity, so, well done. The bag is different this month too – it’s a clear vinyl bag, perfect for stashing away on vacation (possibly airline carry-on safe as well?). Christophe Robin Cleansing Purifying Scrub – 2.7 oz / $19 – (Product is 1.35 oz, value of $9.50 by volume) This is actually a combo sea salt scrub and shampoo. There is no chance that I’d ever use anything like this on my dry scalp since it contains sea salt (REALLY?!) and Sodium Laureth Sulfate. I haven’t used a product with SLS on my hair in years since my curly hair doesn’t need to be stripped of all of its oils with such a harsh surfactant. It’s funny because this is the only product the company makes that contains SLS. And the very idea of rubbing sea salt on my scalp when I have a terrible problem with dryness.. that’s just a disaster waiting to happen. I saw other people report that this strips out color (I dye the ends of my hair a vibrant red using semi-permanent vegetable-based hair dye), so this is a HARD pass for me. It’s also pretty heavily perfumed. I think I may repurpose it as a plain old body scrub or exfoliator, but this isn’t going anywhere near my hair. The company is cruelty free though, so that’s awesome! trèStiQue Highlight & Perfect Multipurpose Stick – .21 oz / $34 – (Product is .04 oz, value of $6.48 by volume) I’m not a big fan of highlighters to begin with, but this is one of those light, opalescent highlighters instead of a glitter bomb. It’s subtle, so I actually like this as a brow bone highlighter to set of eye makeup. It may be just a hair too light for my skin tone, and I’m pretty fair-skinned, but it’s also the only color they offer. The company is also cruelty free. Sunday Riley Ceramic Slip Clay Cleanser – 4.2 oz / $45 – (Product is 1 oz, value of $10.71 by volume) SUNDAY RILEY! I know and love Sunday Riley already since they’re a wonderful cruelty free company. This product says it’s for normal to oily skin, but I love the brand so much, I don’t even care, I’m going to use this up and not even worry about the fact that it doesn’t at all fit my beauty profile. The product dispenses as a cloudy liquid gel that works into a gentle, light lather (not super foamy, just every so slightly bubbly) and rinses away cleanly. I didn’t find it was drying, and the scent was very light. I’m not sure I’d go in for the $45 full size version, but it’s great to be able to try this out! Nudestix Magnetic Matte Lip Color – .1 oz / $24 – (Product is .088 oz, value of $21.12 by volume) I’m not sure why we couldn’t get the extra .012 oz to make this a full size? It seems kind of silly. But, maybe it’s all for the better since this color, “Greystone,” is quite possibly the most hideous color in the history of lip colors. It’s brown. Poop brown, dirt brown, disgusting brown. I’m not sure this color would look good on anyone. I heard people have tried layering other colors over it, but the formula is so opaque and strong that there’s nothing that can make it look good. I mean, all of that would be awesome if it was a pretty color, but this isn’t. It’s terrible. The company though is cruelty free and there are other colors in this line that I actually like, but brown lipstick? No. Just no. Maison Margiela Replica Eau de Toilette – 3.4 oz / $126 – (Product is .04 oz, value of $1.48 by volume) The scent is, “Beach Walk,” and is actually not terrible! The bergamot definitely comes out on top, and while the floral ylang ylang is there, it’s tempered a bit by the musk and cedarwood. It’s a light scent that isn’t a stinky floral and I could absolutely wear this without wanting to scrub it off my skin. It’s not enough of a hit that I’d ever pay $126 for a bottle, but it’s nice enough that I’d use up the sample. Unfortunately, the parent company is L’Oreal, and this company does test on animals. GrandeLips Hydrating Lip Plumper – .05 oz / $27 – (Product is approx 1.2 mL?, value of $20?) I’m totally guessing on the product size – it looks about the same volume as the perfume once you remove the applicator. It’s pretty close to being full size though, just in different packaging. I tried this out already and while it does tingle, it doesn’t burn. I can never really tell if these plumping products actually make a noticeable difference, but it works well enough as a hydrating gloss that I’ll use it regardless. This company is cruelty free too! Overall the value of the box this month comes to $69.29 which is pretty huge for a box that only costs $10.60 a month including tax. Definitely one of the bigger value boxes! I do have to give Sephora some credit this month too since I’d been ranting on about wanting a cruelty free box, and this one was SO close! The only thing that was from a non-cruelty-free company was the perfume. I’m not sure if it’s just because newer indie brands understand that their consumers are looking for cruelty free cosmetics and there’s no need or reason to test cosmetics on animals or sell in countries (*cough-China-cough*) that require the barbaric practice, or that Sephora actually aimed to include cruelty free products this month. Either way, I’m glad to see it happen, and LOOK! No Estée Lauder products this month! It’s like they were listening to me! So, out of 6 products, two were complete failures which leaves me with 4 products I’ll use. I am a little disappointed that they seemed to not have bothered looking at the profiles this month, and I’m kind of sick of getting highlighters already, but I still want to hang on to this subscription for a bit since the price point is low and I’m still getting enough wins to make it worth it. Looking forward to the next month!